Suspension. 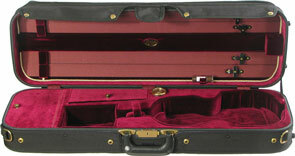 This half-moon shaped violin case is the newest fiberglass case to be added to our line of cases. It offers a stylish new exterior of high gloss finish with a padded cover. 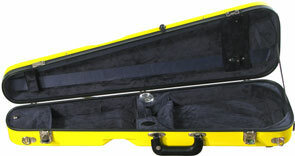 Fiberglass is known for its strength and insulation and the #1047 fiberglass brings a new, lighter and trimmer case look. 4/4 only. 6.50 lbs. This model is only made with Green Exterior and Tan interior at this time. Suspension. 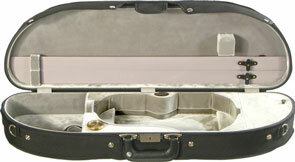 This half-moon shaped violin case is the newest fiberglass case to be added to our line of cases. It offers a stylish new exterior of high gloss finish with a padded cover. Fiberglass is known for its strength and insulation and the #1047 fiberglass brings a new, lighter and trimmer case look. 4/4 only. 6.50 lbs. 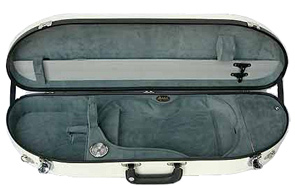 By popular demand, the popular Arrow shaped 1027 violin case is now available with velvet interiors. The slim design adds to the strength of the case while cutting the overall weight. The interior pocket has been enlarged for more protection plus more space has been added for shoulder rest storage. 4/4 Only. Velour Interior. 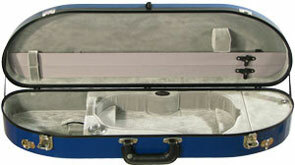 The slim shaped fiberglass violin case is smaller and lighter than our fiberglass oblong cases. The bright colors enhance the luxurioius interiors while providing super strength for the ultimate protection. Fits most carry-on dimension restrictions for air travel. 4/4 only. 6.00 lbs. Suspension. Velour Interior. The new fiberglass arrow shaped model #1027 is our new look on an old favorite. The slim design adds to the strength of the case while cutting the overall weight. 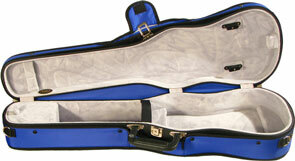 The interior pocket has been enlarged for more protection plus more space has been added for shoulder rest storage. 4/4 only. 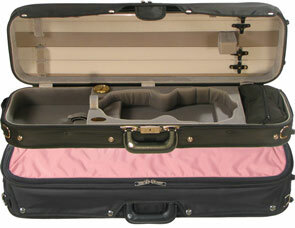 All 1027FB fiberglass cases include protective, padded Travel Cover! 5.30 lbs. Suspension. 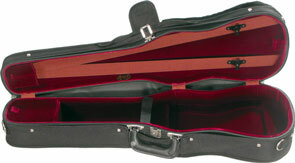 This half-moon shaped violin case is the newest shape to be added to our line of cases. Built with the same five-layered plywood case construction found in our traditional oblong shape and covered with a durable black nylon canvas zippered cover with outside music pocket, the #1047 brings a new, lighter and trimmer case look. 6.50 lbs. 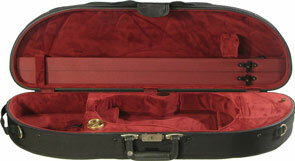 Suspension, The #1047 Puffy Half-Moon Violin Case is a 1047 violin case with a padded cover. 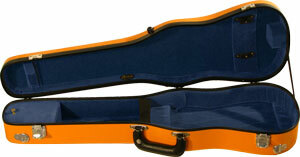 The Puffy case adds a colorful insulated washable cover to the standard 1047 violin case. 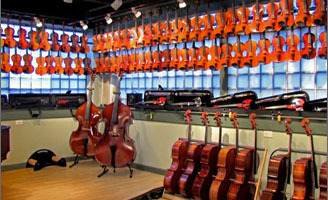 The popular and stylish half-moon shaped violin case is made with the same five layered plywood case construction found in our traditional oblong shape. The #1047 Puffy brings a new, lighter and fun case look. 6.50 lbs. Suspension. The #1047 Puffy Sport Half-Moon Violin Case is like the 1047 Puffy, but with an attractive black canvas exterior that features a colorful top panel, and a removable soft zippered accessory pocket. 4/4 only. 6.50 lbs. The #6002 Puffy Oblong Violin Case is our economy hill style oblong case with a puffy padded cover for more color and style. Model #6002P features luxury at an affordable price, and the bright padded covers will help show off your unique personality. 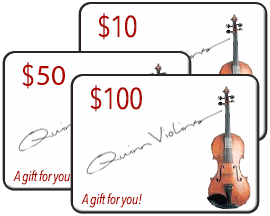 The arched top gives superior protection for up to four bows as well as the fully suspended violin bed. 4/4 only. 6.00 lbs. 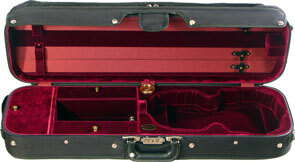 This Oblong Violin case is our best selling case and has set the standard for durability, protection and style with plenty of choices to satisfy everyone. 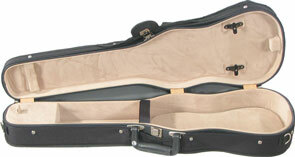 Built using a five layered plywood case construction in the traditional oblong shape, the #1002 violin case is covered with a durable black nylon canvas zippered cover. Also includes shoulder strap. 7.00 lbs. This is the newest addition to our economy line of cases. The #6002 is also our lightest oblong suspension plywood case. The arched top gives superior protection for up to four bows as well as the fully suspended, bonded economy velvet violin bed. You"ll find all the preferred features of a more expensive case in the #6002. 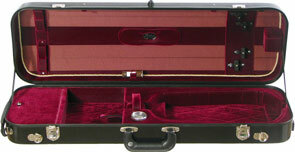 This includes a French fit body form, a hygrometer, humistat, and a large accessory pocket with a solid brass hinge. Black canvas exterior. 4/4 only. 6.00 lbs. 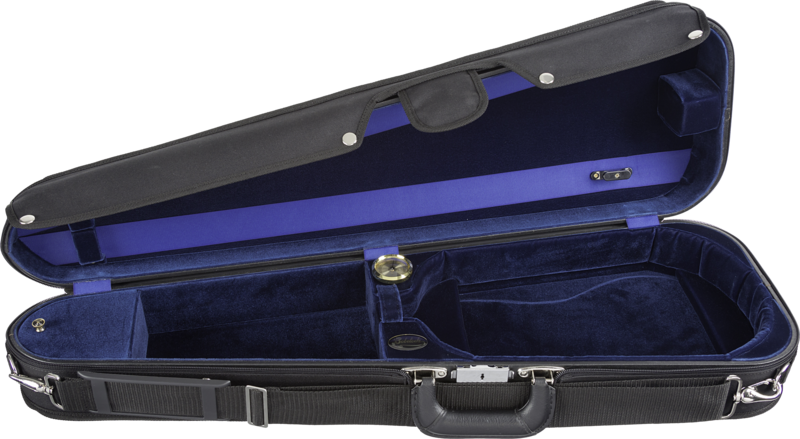 The #6002 Puffy Sport Violin Case is a twist on the popular economy hill style case with a puffy padded cover for more color and style. Sport detail means the top panel of the cover has two toned black with choice of colors for a distinctive look. 4/4 only. 6.00 lbs. 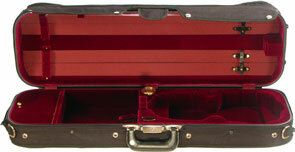 The Hill Style oblong violin case is considered a standard professional case that offers durability, protection and style for the collector and the player. 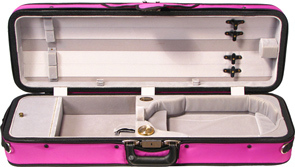 Built using a five layered plywood case construction in the traditional British oblong shape, suspension pads, and the semi French fit interior, the #1017 violin case is covered with a durable nylon canvas zippered cover and outside music pocket. 4/4 only. 7.50 lbs. 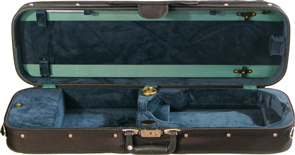 This Hill Style oblong violin case is a very luxurious case created to satisfy even the most discriminating collector and player. 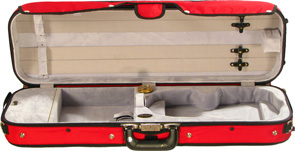 Built using a five layered plywood case construction in the continental oblong shape with full French fitted Suspension interior, the #1051 violin case is covered with a durable nylon canvas zippered cover and outside music pocket. The #1051 has been redesigned on a slant to increase shock protection and allow for more interior storage. You will also notice the attention to the finished detail including our unique patented bow holder design mechanism. This is what makes this case comparable to the most elegant European cases. Black canvas exterior with brass fittings! 4/4 only. 8.00 lbs. Velour Interior. With Suspension. 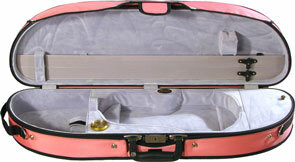 The 1007 shaped Violin case has been given extra appeal with the addition of our bright and fun. Puffy covers in five new colors. The slightly padded nylon covers enhance the rugged plywood shell while providing super strength for ultimate protection. In addition, the bright colors enhance the luxurious interiors making this case perfect for the young at heart. 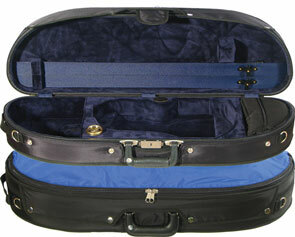 Fits most carry-on dimension restrictions for air travel. 4/4 only. 5.30 lbs. 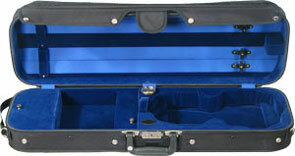 The slim shaped violin case offers durability, protection and style without the bulk and weight of an oblong style case. 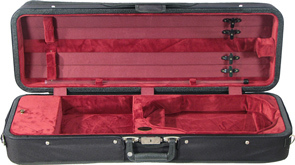 Built using a five layered plywood case construction, the #1007 violin case is covered with a durable black nylon canvas zippered cover and a small outside accessory pocket. Fits most carry-on dimension restrictions for air travel - only 27" long! Black canvas exterior. 5.30 lbs. Suspension. 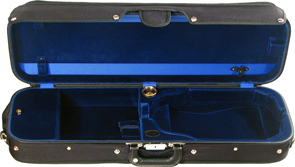 The oblong featherlite violin case is the perfect case for players looking for the same reliability and design that makes Bobelock cases recognized throughout the world, but weighs much less than our traditional wooden cases. 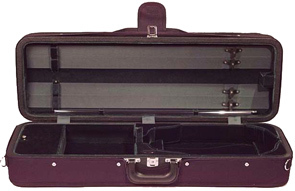 Built using a combination of layered plywood and styrofoam case construction in the traditional oblong shape, the #1003 violin case is covered with a durable black nylon canvas zippered cover and outside music pocket. 4/4 only. 5.50 lbs. Velvet Interior. With Suspension. The 1003 Puffy has the lightweight shell, with fun new color combinations. 4/4 only. 5.5 lbs.